Ashoka: You've been a global defining force in several spheres, including microcredit and more recently, social business. What's got your attention right now? Professor Yunus: We're in a moment of tremendous change - not linear but exponential - and we need to bring our society through a transition process to one of more evenly distributed wealth and power. This is summed up in my three focus areas that are foundational to everything else: zero poverty, zero unemployment, and zero net carbon emissions. Within this, I'm drilling down on unemployment and wealth concentration. We all know that the world's wealth is controlled by a handful of people. More worrying is the speed at which wealth is further concentrating. Today we are talking about the one percent. Tomorrow it will be half a percent, then one-tenth, and so on. This is totally disastrous, so we need to work quickly to undo the harmful things that are reflected in our economic framework and move toward a new, more selfless civilization. So I am spending time sharing how to achieve this and what role new frameworks in social business and education can play. Ashoka: How does zero unemployment happen? Professor Yunus: This is built into microcredit and demonstrated by 8.5 million borrowers in Bangladesh and some 140 million globally. Most are women - some are successful entrepreneurs, others are struggling entrepreneurs. Regardless, this is the path they wanted. If an illiterate woman living in a remote village in Bangladesh can turn herself into an entrepreneur, why is a literate person with a university degree sitting around because no one will give him a job? We have equipped him with absolutely the wrong mental lens. That is where we went wrong. Unemployment is an artificial state and it doesn't belong to human beings. We are not born to sit around and watch, doing nothing. Today, our education system produces job seekers ending up with a job application when it should prepare job creators armed with a business plan. This is a very different mindset and it leads to a happier life and more stable economy. Professor Yunus: I don't say alternative, I say it's the reverse. Everything we have done is the reverse of conventional. They go to the city, we go to the village. They go to men, we go to women. They say people should come to the bank, we say the bank should go to the people. They say you need to be job seekers, we say job creators. They say business is about maximizing profit, we say forget about profit, all we want to do is solve problems. Everything is opposite. In the new civilization, everything has to be done in the reverse way. Ashoka: Let's talk about education. What would a "reverse" school look like? Professor Yunus: We need to redesign education so that it supports young people to become full human beings and create the world they want to live in. So a reverse school gives them practice building their own ideas for the future, helping their peers do the same, and then stepping back to see how it all fits together. What does the world imagined by the class of 2016 look like? What about the class of 2017, 2018 and so on? This back and forth - individual and collective, one piece and the whole - will help young people ask themselves: What role do I want to play? What's inside of me that I can contribute? In the old days, we used to say that the whole idea of growing up should be "know thyself." We have lost this and we need to bring it back. And why wait for graduation to set dreams in motion? Young people are full human beings and quite capable. Ashoka: What advice do you have for parents? 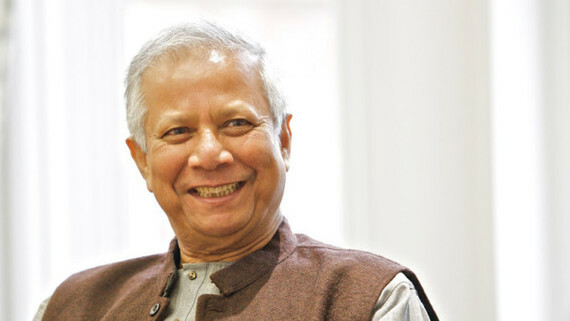 Professor Yunus: The best advice I have for parents is to give your child space. Treat her like a full person right from the beginning. If you always hold her on your lap, she will not grow. Let her discover her own world. She may explore things you don't like but let her curiosity and sense of her own capacity develop. It's a very difficult balance and requires some skill, knowing when to help and when to stay out of the way. Every single person has unlimited capacity and it's the job of parents and teachers and all of us to help young people peel off the layers and discover themselves. Only then can they fully contribute. This post is part of a "Thriving in a World of Change" series produced by The Huffington Post and Ashoka. The series is part of The Huffington Post's coverage of The World Economic Forum's Annual Meeting, and explores how, in an age of unprecedented change and connectivity, we must transition quickly to an everyone-a-contributor world with empathetic ethics at its core. Read all the posts in the series here.